Beneath the summer sunshine and craggy Appalachian peaks, the rivers are running. It’s the perfect time to explore the best of our mountain waterways. From flatwater family-friendly lakes to raging whitewater rapids, River Right is your guide to water play in the mountains. In the following pages you’ll find profiles of featured river outfitters, as well as popular riverside destinations and events. For anglers, we also highlight some of the best fishing locations in the region, including world-class creeks and streams to catch bass and trout. 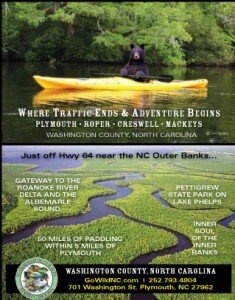 Check for updates and discounts on River Right online at BaseCamp.BlueRidgeOutdoors.com. It’s no exaggeration when West Virginia claims to hold America’s Best Whitewater. The Mountain State’s world-class rivers hold a range of paddling and whitewater rafting opportunities for everyone from the adventurous novice to the seasoned expert. Known as the second-oldest river in the world, the New shows its wild side in West Virginia, as it drops 240 feet over one 14-mile stretch and cuts its way through a 1,000-foot-deep sandstone gorge. The New’s class I to V rapids make it one of the most popular runs in the country. The mild Upper New is perfect for beginner fun with float and fishing trips, while the Middle New beefs up the excitement with class II and III rapids. The famed Lower New delivers stomach-dropping excitement with class IV-V rapids through the heart of the gorge and underneath the longest steel arch bridge in the Western Hemisphere. North of these two rough and tumble rivers, lies the boulder-strewn canyon of the Cheat. Snowmelt and spring rain give the Cheat more than 30 technical rapids in the class III to IV range. 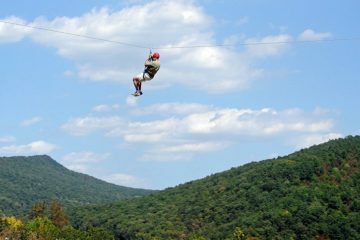 At Adventures On the Gorge, Southern West Virginia adventure vacations are much more civilized than they once were. Although there are still plenty of primitive campsites and pure wilderness for guests seeking the traditional experience, “roughing it” is no longer required. Now the whole family can STAY CIVILIZED while you PLAY WILD! When you PLAY WILD, your inner adventurer is unleashed. Our top-notch equipment and 40 years of expertise help you attempt things you’ve never done before and discover the excitement and serenity of the great outdoors. Whether you’re paddling exhilarating whitewater, soaring through the treetops, scaling sandstone cliffs, or tearing up the trails, you’ll be completely immersed in nature and forever changed by the experience. But every great vacation needs some down time to let the excitement of the day soak in. Take advantage of free onsite entertainment and amenities like Canyon Falls Swimming Hole, hiking and biking trails, easily accessible gorge overlooks, sand volleyball courts, outdoor movies, disc golf, live music, and our children’s playground. And because you really work up an appetite when you PLAY WILD, three award-winning onsite restaurants serve up hearty fare with our trademark hospitality. When it’s time to turn in, diverse lodging options from five stars to under the stars let you decide how much to “rough it” while on your adventure vacation. Tucker County’s fishing options are numerous with most freshwater species able to end up bending your rod. Most rivers contain good populations of trout including Rainbow, Brown, Brook, and West Virginia Golden. The Blackwater River (upstream from the Canyon) is heavily stocked and one of West Virginia’s favorites. Many native Brook trout streams can be found if you look hard enough. April through June is a good time to pursue these trout using spinning gear. There are two special regulation areas that are accessible, including the Red Run fly-fishing-only stream and the Blackwater Canyon catch and release area. Red Run contains a good population of Native Brook Trout while the Canyon sports trophy Brown and some Rainbow. Clear running streams such as the Dry Fork, Shavers Fork, and the Glady Fork offer some fantastic fly-fishing opportunities during most of the year. These streams also hold good populations of Small Mouth Bass that are active in the summer and fall. A great outing consists of floating the Cheat River, where the Small Mouths are making a comeback. Blackwater Outdoors Adventures can get you on the fish. Speaking of bass, most of the beaver ponds in the north end of Canaan Valley contain some nice Large Mouths. It makes for great fun on surface lures on a quiet summer evening. Enjoy affordable adventure outings close to DC! River & Trail Outfitters offers fun for all ages. Mellow tubing for ages 5 and up, rafting for ages 7 and up, scenic paddling tours to award-winning wine, beer, and spirits for ages 21 and up, and much more. Multi-generation activities are a specialty for our 3-generation family-run, company! Convenient. Affordable. Easy. Doesn’t that sound perfect? • 40th Anniversary season as the oldest adventure company in the Harpers Ferry region means exciting specials for guests, all season long! Water and land-based adventure outings. Adventure packages mean maximum fun for you, while we take care of planning, logistics, gear, and guides. • Paddle & Pour kayaking/canoeing guided tours to award-winning local Tarara Winery, Barley & Hops Brewery, and new for 2012, Cello Distillery. • Complete Paddle Sports Store with top brands like Wilderness Systems, Perception, Dagger, Wenonah, gear, clothing and more. Get out of the city and enjoy your Metro DC / Baltimore Adventure Backyard with us. 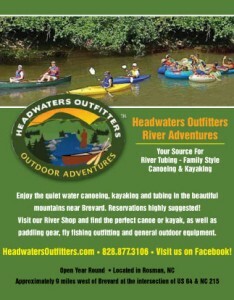 Headwaters Outfitters is your source for river style outdoor family fun. We offer canoeing and kayaking river trips, fly fishing, destination paddling adventures, and water safety courses. Our paddling trips can last from three hours up to a two-day river/camping trip, or you can cool off with a lazy float down the beautiful French Broad River on our popular tubing trip. Most of our trips are self-guided, but all of our seasonal special trips include knowledgeable guides and special arrangements can be made for individualized guided trips. The stellar fly fishing programs we offer are with licensed guides on the rivers of western North Carolina. Our guides will lead you to trout or smallmouth, teach you to cast, and help you choose flies that will increase your success on the water. Headwaters Outfitters stocks the best selection of canoes, kayaks and fly fishing gear to outfit you for your next big adventure. We provide personalized service and product knowledge, and a great location on the French Broad. We are conveniently located just outside Brevard, between Asheville and Highlands. 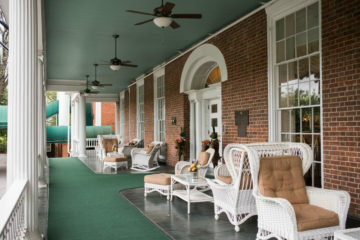 We are an easy one-day trip from Charlotte, Greenville, or Raleigh, and a great weekend getaway from Atlanta, D.C., or Knoxville. 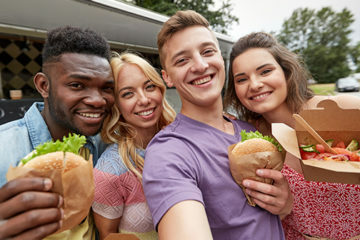 So when planning your next vacation (or stay-cation) to the mountains, call us at 828-877-3106, pack a picnic lunch, bring your fishing rod, and gather your friends and family to join us for an unforgettable adventure! If you want to leave the hustle and bustle of daily life behind and instead seek close encounters with nature, then Washington County is the place for you. Discover a place still wild more than 300 years after the English arrived—where eagles soar above the ancient Roanoke River while black bear, deer, and small game roam the woodlands and fields, and wild geese and tundra swan cover sparkling Lake Phelps. Whether your interest is in photography, bird watching, paddling, camping, fishing, or hunting, Washington County surrounds you with forest, field, swamp, game, and fish. 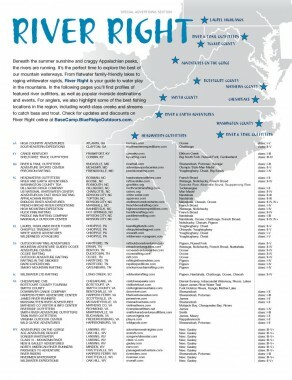 For those interested in paddling, cruising, and fishing in undeveloped waterways, the Roanoke River Basin and the Albemarle Sound, Lake Phelps in Pettigrew State Park, the Scuppernong River in Creswell, and over a dozen other streams are sure to provide you enough to explore again and again. Freshwater fish are abundant, including largemouth bass, striped bass, bream, speckled perch, and white perch. The wildlife and natural surroundings here will amaze you, as ancient cypress trees along the shoreline serve as home for nesting osprey. Relax by the water or camp in the wild forests. What the county lacks in population, it makes up for in outdoor adventure. Instead of the dull roar of traffic and congestion, you will only hear the wind in the trees and the calls of birds. Find out more by visiting our website or call us. Your adventure awaits in Washington County! Go Wild! 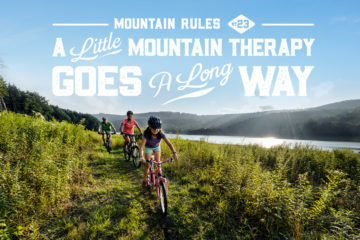 River and Earth Adventures is a guide owned and operated adventure outfitter with headquarters in Boone, N.C. and outpost locations in Asheville, N.C. and Elizabethton, Tenn.
Our mission is to provide you with the highest quality outdoor adventure in the world. We guarantee you a safe, thrilling, and memorable experience by offering expert guides, pristine wilderness, top-of-the-line equipment, and the best lunches on the river. From exploring hidden caves or relaxing on languid river cruises, to high adventure rafting, we allow you to explore the best natural secrets of the Appalachian Mountains. At River and Earth Adventures, we are dedicated to world-class adventure, eco-education, and healthy, sustainable living. 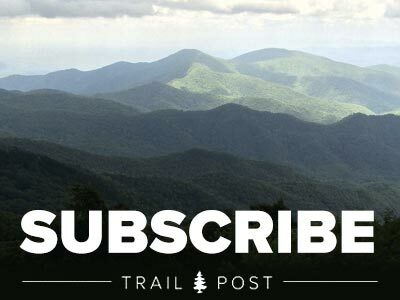 Your adventure is your time to connect with friends and family, while challenging yourself in the most breathtaking natural areas of the Southern Appalachians. Among the many adventures we offer, you can choose from rafting, cave exploration, guided hikes, kayak instruction, kayak, canoe, and tube rentals, steep creek tours, gem mining, rock climbing, and even accredited merit badge programs. We also specialize in custom trips featuring local and organic foods. It’s easy to sign up for a trip or even design your own adventure. Give us a call and we’ll chat about your budget, comfort level, and experience, and we’ll help you find the adventure that is perfect for you and your family. With River and Earth Adventures, you have friends in the High Country! Although categorized as Virginia’s second smallest county, Mathews claims over 200 miles of Chesapeake Bay shoreline—more than any other county in the state. Rich in Maritime tradition, and with over 20 public water access points, this Pearl of the Chesapeake offers a charming and friendly atmosphere abundant in history, wildlife, scenery and art. Visitors are encouraged to explore, whether that be by way of Paddling and Bicycling, Birding and Wildlife Trails, Historic Walkabouts, or Fishing and Water Sports. Spend the night in one of Mathews’ many Historic B&B’s or rent a picture-perfect Cottage after dining at one of our fine local restaurants. Mathews’ true spirit is most evident at their annual community events: Longest Yard Sale, Market Days, Gwynn’s Island Festival, Tour de Chesapeake, and Open Studio Tour. In the mood for entertainment? Experience Donk’s Theatre, Courthouse Players, Concerts by the Bay, and live music at local eateries. For those of you who just want to drop on by, there’s always the Farmer’s Market, The Poddery, Art Galleries, Artists’ Studios and Gift Shops. Home to the third oldest lighthouse on the Bay, a cultural arts center, two museums, nature preserves, and an active artisan community, Mathews County offers something for everyone. Anglers can’t beat the experience of escaping to the mountains and exploring the seemingly endless offerings of the Blue Ridge Highlands Fishing Trail. Follow the trail and experience casting among some of the most scenic and secluded terrain in southwest Virginia. The trail highlights premiere fishing destinations in four counties—Smyth, Wythe, Washington, and Grayson—including big rivers, secluded streams, and quiet lakes. Grab your rod and visit one of the trail’s many natural gems, including the New River, second only to the Nile as the oldest river in the world and ranked as one of the top 5 best smallmouth bass fisheries in the country. Trout lovers should seek out the high country flow of Whitetop Laurel Creek, set in the vast wilderness of the Mount Rogers National Recreational Area. 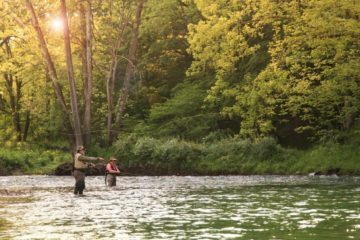 Starting in in Smyth County near Sugar Grove, the South Fork of the Holston River is one of the premier trout fisheries in the Commonwealth, ready for you to pull plenty of wild rainbows and brown trout. If you prefer lake fishing, the Virginia portion of the South Holston Reservoir offers anglers more than 1,600 surface acres of water for finding bass, walleye, catfish, and crappie. Located at the top of 3,600-acre Clinch Mountain, Laurel Bed Lake, a tranquil waterway shrouded by second growth hemlock and mixed hardwoods with opportunities to catch smallmouth bass, sunfish, and trout. Come experience the best fishing in the Blue Ridge. On your trip, stop by the H.L. Bonham Tourism Center in Smyth for more information. See the Blue Ridge Mountains as you’ve never seen them before as you paddle the Upper James River though Botetourt County, Virginia. At river level you won’t just see the mountains; you’ll interact with them as you meander through valleys and past rolling farmland keeping a watchful eye out for native wildlife. Some Class I and Class II rapids make it a fun day for all members of the family by canoe, kayak or tube. The unspoiled beauty of the river is more accessible than ever through the Upper James River Water Trail. The trail was created to encourage residents and visitors to experience one of the county’s greatest natural treasures and protect the beauty and character of the river for generations to come. Paddler, anglers and families can get back to nature and enjoy the sights and sounds of 45 miles of the Upper James, including 14 pristine miles designated as a Virginia Scenic River. If you’re bringing a canoe or kayak, there are numerous public access points with free parking. For those needing gear, private outfitters are ready to help make your trip a memorable experience with expert advice, equipment rental and shuttle service. 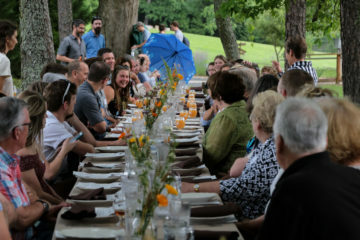 Plan your entire trip, including ideas for lodging, dining and activities in Botetourt County at www.upperjamesriverwatertrail.com and discover a new way to experience the Blue Ridge. It doesn’t get much better than exploring the scenic landscape of Coastal Virginia on the water. The historic city of Chesapeake has plenty of surrounding natural treasures for paddlers and boaters, including 22 miles of fresh and salt waterways. A major highlight is the Dismal Swamp Canal, which connects southeastern Virginia to northeastern North Carolina and is recognized as the oldest, continuously operating waterway in the United States. The canal flows through the heart of the Great Dismal Swamp, offering outdoor enthusiasts magnificent views of the coastal wild and glimpses of its diverse wildlife. Atlantic white cypress trees line the canal banks as deer, river otters and the occasional black bear romp in the surrounding idyllic refuge. Explorers navigating the canal during spring and fall migration can also spot neo-tropical birds passing through the region during their bi-annual pilgrimage. Other staples include Lake Drummond, the state’s second-largest natural lake, which sits as a tranquil, wooded escape for both paddling and sport fishing. Water lovers should also visit Northwest River Park and Campground, which features the flowing Northwest River, as well as a 300-acre lake and plenty of opportunities to spot local wildlife. 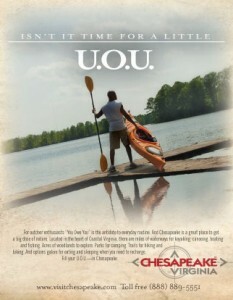 On June 9-10, Chesapeake will host KayaXpedition, a two-day paddling event with a range of activities for kayak enthusiasts, including fun paddle races, skill demonstrations for both beginners and experts, safety tips and guided kayak tours covering the city’s secluded waterways. Every year, hundreds of thousands of whitewater boaters flock to Ohiopyle State Park to run the rumbling rapids of the Youghiogheny River. Situated at the southern end of Pennsylvania’s majestic Laurel Highlands, the park holds the most exciting stretches of the Yough, offering a range of whitewater experiences for all levels from beginner to expert. With exhilarating class III-IV rapids, the seven-mile stretch of the Lower Yough is a popular choice for those seeking an adrenaline rush, holding the busiest section of whitewater east of the Mississippi. The Middle Yough is a tamer class I-II option that’s just right for a beginning kayak trip or a whitewater rafting outing for families with young children. Last year, another whitewater paddling option was opened in the Laurel Highlands at Stonycreek Canyon. A new valve in the Quemahoning Dam now enables scheduled whitewater releases through the canyon, offering adventurous boaters an amazing 15 rapids in four miles—the highest concentration in the eastern United States. More mellow paddling options can be found on Quemahoning, and kayakers can hone their skills at Whitewater Park, which holds Pennsylvania’s first set of constructed rapids in the Stonycreek River, about three miles south of Johnstown. On August 18, you can join fellow paddlers at the 14th Annual Ohiopyle Over the Falls Festival. Boaters travel from across the country to experience the one day each year they are allowed to run the tumultuous 18-foot Ohiopyle Falls.